Finance Tech Forum is a great occasion to meet YOU, so visit our booth and discover how Dynatrace delivers an outstanding digital experience. "How to Master Customer Experience and Application Performance - The Raiffeisen success story". Come and join us to see a live Dynatrace DEMO during the conference at any time or the afternoon break at 16:10 in our booth. 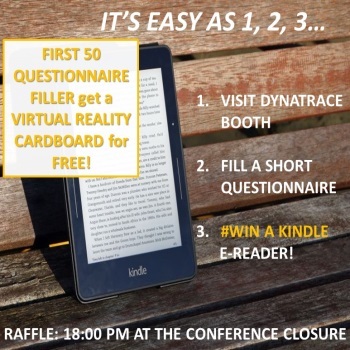 PLUS: first 50 questionnaire filler gets a Virtual Reality Cardboard for free. If you are interested in digital banking performance, check out the best practices of digital performance masters and download the e-book now from our website: How to modernise your Digital Banking Analytics and improve customer experience?